[post_content] => Consider this: How do the artist and the scientist come together to shape individuals’ environmental attitudes and behaviors? I used this question as a jumping off point for my Directed Research project at The SFS Center for Coastal Studies in Baja California Sur, Mexico, in the spring of 2009. As an art history and environmental studies double major, I was interested in the connection between what many people would often view as two dissimilar fields. (Cue the question:  “What are you going to do with that?”). However, several towns in Baja had prominent sea turtle murals painted by school groups or local conservation NGOs, and I had a hunch: if the visual arts could be used to advertise consumer goods, couldn’t they also be used to communicate with and educate local community members on issues of marine conservation? Through surveys and interviews, I asked community members if they had seen a mural, and if yes, in what way did it affect them? After weeks of data collection and analysis, it turned out that the murals were, in fact, visible, and the responses suggested that the murals were more than just a decorative piece of art. The data suggested that the murals influenced community members’ attitudes and behaviors towards sea turtle conservation. These results opened my eyes to how artists -- passionate about the environment -- could work alongside biologists and others who sought to create awareness and positive change. Art can be used in science classrooms to challenge students to think creatively in problem solving. Art can be used as a means to start a dialogue in a community. Perhaps most importantly, art can remind individuals that their environment is beautiful and worth protecting. Answering this question led to some interesting outcomes for me personally. My SFS research won The Forum on Education Abroad Undergraduate Research Award, a national study abroad award. My work is also now part of a permanent exhibit at The Monterey Bay Aquarium. 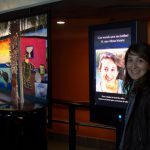 The Ocean Travelers gallery features the work of environmental artists, Chris Jordan, Bryant Austin, and Alison McDonald, and builds awareness of environmental issues affecting the ocean and how people can help. For more information, check out The Monterey Bay Aquarium’s SeaNotes blog. The research was published in 2014 in Ocean and Coastal Management. You can access the article here. Anne Kubitsky SFS Mexico ’04 has written and illustrated a book, Graycie’s Catch, based on the true events of a whale rescue off the coast of California. The first draft of the book is being sold as a coloring book, inviting readers to interact and become artists themselves. Through collaboration with scientist and ocean activist, Wallace J. Nichols, Anne hopes to connect the book to the Live Blue Initiative to connect young readers to the idea of ocean conservation. Sadie Runge SFS Australia/New Zealand ‘10 of the University of Richmond organized and produced The James River UFO, an Environmental Art Performance Event, which protested pollution in the river. Sadie collected chicken by-products from a local farm and reused them to create a floating raft of feathers, which have been shown to absorb toxic heavy metals from water. The project aims to create awareness for contamination in the river and prompt community dialogue and action. Matt Richter SFS Bhutan ’10 pursued photojournalism and environmental studies as an undergraduate at Boston University, participated in SFS’s first summer program in Bhutan, and returned to Bhutan as an intern. Matt uses his camera to explore both his cultural and natural surroundings, and his photographs provide an intimate view into daily life in remote villages and communities in the Himalayas. Cornelia Carpenter SFS Kenya ’09 illustrated the book, Mgunga: A Day in the Life of an Umbrella Thorn Acacia, inspired by her experience living and studying in the East African savannah. The story is told through pictures and illustrates the significant relationship that the acacia tree has with every creature in the savannah. Cornelia is currently pursuing her passion for cartography. She recently completed a trip to Australia, where she explored the landscape to create a map that will be featured in a documentary DVD, “Restoring Community; Community Restoration across the Wet Tropics.” Her maps feature the local flora, fauna, and culture of a landscape, and serve as both functional and nostalgic pieces of art. How do you think that the artist and the scientist can, should, or must work together to change our behaviors and attitudes about the environment? How are you doing this? Let us know. [post_excerpt] => How do you think that the artist and the scientist can, should, or must work together to change our behaviors and attitudes about the environment? [post_title] => Study Abroad in Peru! [post_excerpt] => Want to learn more about the Biodiversity & Development in the Amazon semester program in Peru? Watch this 5 minute mini-webinar! Congratulations to Juliana Mayhew on taking the top prize in our photo contest! Over the past year, SFS students around the world captured images of their time in the field. We asked students to submit shots that portrayed the "observer and the observed," and we received hundreds of incredible shots featuring professors, classmates, and community members engaging with the natural world. We posted our finalists on our Facebook page and let the SFS community choose our winner. Juliana is a biological sciences major at Dickinson College. She studied abroad with SFS in Turks & Caicos  in the spring of 2012, where she captured this incredible underwater experience. "We were diving along the wall when we came across this curious hawksbill sea turtle. For just a few moments it did not seem to matter that we, as humans, were only visitors in this weightless world. This incredible encounter will always stand as a reminder that every living thing is interconnected and we have the ability to coexist peacefully," said Mayhew. Theresa Wondra, from the University of St. Thomas, took both second and third place for her stunning photos taken during the SFS Bhutan program in the summer of 2012. "Visiting Tiger's Nest Monastery was something I had been anticipating our entire program. We spent our last full day in the country hiking up to visit this incredible monastery constructed in the side of the mountain. It is such a magical place. This photo became one of my favorites since it captures a moment of reflection as a Bhutanese man, dressed in his traditional clothing, sits and takes in this wondrous site," said Wondra. Commenting on the photo below, which placed third in our contest, Wondra said: "This photo was taken during our three day trek through Bhutan's breathtaking mountains and valleys. It was an exciting moment, as we reached the highest point of that day, and the rest of the day's trek was pretty much down the mountain from there. We were greeted by such a beautiful site. Vibrant prayer flags were strung up throughout the trees, blowing in the wind, as our horses stopped to snack on the lush vegetation that surrounded us. It was a moment I want to always remember." Juliana Mayhew also received an honorable mention for her photo taken at the old coast guard station on South Caicos. Devin Gorsen, a Davidson College and SFS Tanzania Summer 2012 student, was awarded an honorable mention for her up close encounter with an elephant. [post_excerpt] => We asked students to submit shots that portrayed the "observer and the observed," and we received hundreds of incredible shots. [post_content] => SFS Admissions Counselor Amy Sullivan and Dean of Academic Programs Mark Seifert recently returned from a trip to Southeast Asia where they continued to develop The Living Mekong program in Cambodia and Vietnam, which launches in the fall of 2014. Their trip involved many of the same expeditions and excursions that students will experience—from the lush forests of Phnom Kulen, to the ancient Ankgorian temples, to the busy markets of Phnom Penh. Ripe mangosteen at the morning market in Siem Reap, Cambodia—one of many exotic fruits and vegetables sold here. Fresh catch from the waters of the Tonle Sap. The lake provides about 75% of Cambodia’s annual fish yield and is a critical resource both economically and nutritionally for Siem Reap residents. A mother and daughter set up shop at the morning market in Siem Reap, Cambodia. A guide at the Banteay Srey Butterfly Center shows a collection of pupae. The Center serves as both a tourist attraction and an additional source of income for butterfly farmers in the community who are encouraged to help conserve rare species. The stilted fishing village of Kampong Kleang rises above the Tonle Sap. During the rainy season, the Mekong River swells and forces the Tonle Sap River to reverse direction, flooding the lake. As the waters recede during the dry season, these villages tower several meters the water level. The view from a Tuk Tuk—the best way to get around the busy streets of Phnom Penh, the capital city of Cambodia. Angkor Wat is the largest religious structure in the world. Built in the early 12th century, this elaborate temple represents Mount Meru, home to the gods in Hinduism. Named a UNESCO World Heritage Site in 1992, it is the most popular tourist attraction in Cambodia and is proudly displayed on the country’s flag and currency. Graceful Apsara dancers are carved along the walls of Angkor Wat. Apsaras are supernatural female spirits in Hindu and Buddhist mythology, and the traditional Khmer dance is called the Apsara dance. The giant stone faces of Bayon, a Buddhist shrine built by Jayavarman VII in the late 12th or early 13th century. Strangler figs have taken over at Ta Prohm. Little restoration work has been done and the temple essentially remains in the ruinous state in which it was discovered. The tourism industry peaks during the dry season in Cambodia. Temples such as Pre Rup seen here teem with tourists from all over the world from February through July. Much of the Phnom Kulen National Park forest remains virtually untouched by ecologists. Scientists have only recently begun cataloging the many species of insects, birds, rodents, and other mammals that exist in these woods. The area is still threatened by the logging industry. Waters surge at Kbeal Spean in the forests of Phnom Kulen. Lingas are carved into the river bed and are said to give life and fertility to the waters as they flow into the Siem Reap River. A distributary of the Mekong River as it flows through the delta in Can Tho, Vietnam. The Mekong runs through China, Burma, Laos, Thailand, Cambodia, and Vietnam before reaching the South China Sea. Researchers from Can Tho University are leading the effort to study the specific ecology of the delta and the impact of upstream dams and climate change on the fragile ecosystem. Canoes are often the best mode of transportation in Kratie, Cambodia, a rural town along the Mekong River that experiences heavy flooding during the rainy season. Sunset over Ochheuteal Beach in Sihanoukville, Cambodia. The coast of Cambodia offers a beautiful respite from the bustling cities, with plenty of mangrove forests to explore. [post_excerpt] => SFS Admissions Counselor Amy Sullivan & Dean of Academic Programs Mark Seifert recently returned from a trip to Southeast Asia where they continued to develop The Living Mekong program. [post_content] => We're excited to announce that you can now find The School for Field Studies on Instagram! Follow @thesfs to see what life in the field is like through the lenses of SFS staff and students. Have your own photos to share? Tag them with #TheSFS. Don't have an Instagram account? You can still follow our stream here: http://instagram.com/thesfs, or on our Facebook page. [post_title] => SFS is on Instagram! [post_content] => We wanted to share a collection of photos taken by SFS Admissions Manager, Ellen Reid, Vice President for Academic Affairs, Dr. Robin Sears, and Director of Safety and Student Life, Molly Hurst, in Peru where as they developed Biodiversity and Development in the Amazon, which launches in the fall of 2014. Their trips involved many of the same expeditions and excursions that students will experience—from the Andes Mountains to the lowland Amazon rainforest. Click here for more information on the program and to apply! The Peruvian Amazon region comprises 60 percent of the country and is considered a global hotspot of biological and cultural diversity. The forest canopy, as seen from a canopy tower nestled in the crook of a Ceiba tree on the Río Manu, hosts a rich variety of life forms, including epiphytes, hemi-ephiphytes, insects, mammals, birds, and more. Travel from the forested foothills of the Andes to the lowland tropical rainforest is mostly on rivers, the true highways of the Amazon! Peru is home to many species of butterflies, which can often be seen exhibiting "mud-puddling" behavior along riverbanks in Amazonia. Butterflies sip moisture from the puddles and take in salts and minerals from the soil. Peru ranks among the top five countries of the world for the number of bird, amphibian, reptile, and mammal species within its borders. Here, a Blue-throated Piping-guan (Pipile cumanensis), walks along a constructed path at the Manu Wildlife Center. Manu National Park is home to more than 1,000 species of birds, about 10 percent of the world's bird species. Exploring Peru involves long, windy roads and rivers that take you through puna (high altitude grasslands), cloud forests, rainforests, and everything in between! From its perch in the Andean cloud forests, the beautiful Wayqecha field station has amazing views from treeline, over the cloud forests, and on down through the foothills to the Amazon. The station will be "home" during a weeklong excursion. Peru is one of the ten most biodiverse countries in the world. The cloud forests around the highland Wayqecha station and the transitional forests at the mid-elevation Villa Carmen field station are well known for an abundance and diversity of orchids. The dynamic and scenic city of Cuzco, situated high in the Andes mountains, is a UNESCO World Heritage Site, renowned for its meeting of two distinct cultures; Inca and Hispanic. Many of the city's buildings date back over nine centuries! On mid-semester break, students may elect to travel to Machu Picchu, an icon of Inca civilization. A UNESCO World Heritage Site and one of the New Seven Wonders of the World, it is no wonder that Machu Picchu is Peru's most visited attraction. Peru's cultural diversity includes 44 ethnic groups (42 of which are in the Amazon), speaking 14 language families! Here, a highland Quechua woman demonstrates traditional weaving in a community-run market. Click here to learn more about Peru: Biodiversity and Development in the Amazon. [post_excerpt] => We wanted to share a collection of photos taken by SFS Admissions Manager, Ellen Reid, Vice President for Academic Affairs, Dr. Robin Sears, and Director of Safety and Student Life, Molly Hurst, in Peru. [post_title] => Vote in the 2014 Photo Contest! [post_excerpt] => Voting is now open for the 2014 SFS Photo Contest! [post_content] => Peru's Manú National Park, situated on the eastern slope of the Andes and stretching down to the lowland Amazon rainforest, is one of the most biodiverse protected areas on the planet. Its variety of habitats – from puna grassland to cloud forest to lowland rainforest – supports more than 200 species of mammals, more than 1,000 species of birds and butterflies, and recently set a biodiversity record for reptiles and amphibians. The park, which is recognized as a UNESCO World Heritage Site and Biosphere Reserve, is also home to several indigenous groups. On a recent excursion to the park, SFS students experienced the change in ecosystems as they descended in altitude and observed interactions of visitors to the park with tribal communities living in the region and the natural environment. [post_excerpt] => Manú National Park is one of the most biodiverse protected areas on the planet. [post_title] => Study Abroad in Cambodia! [post_excerpt] => Want to learn more about The Living Mekong semester program in Cambodia? Watch this 5 minute mini-webinar! Consider this: How do the artist and the scientist come together to shape individuals’ environmental attitudes and behaviors? I used this question as a jumping off point for my Directed Research project at The SFS Center for Coastal Studies in Baja California Sur, Mexico, in the spring of 2009. As an art history and environmental studies double major, I was interested in the connection between what many people would often view as two dissimilar fields. (Cue the question: “What are you going to do with that?”). Through surveys and interviews, I asked community members if they had seen a mural, and if yes, in what way did it affect them? After weeks of data collection and analysis, it turned out that the murals were, in fact, visible, and the responses suggested that the murals were more than just a decorative piece of art. 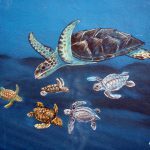 The data suggested that the murals influenced community members’ attitudes and behaviors towards sea turtle conservation. These results opened my eyes to how artists — passionate about the environment — could work alongside biologists and others who sought to create awareness and positive change. Art can be used in science classrooms to challenge students to think creatively in problem solving. Art can be used as a means to start a dialogue in a community. Perhaps most importantly, art can remind individuals that their environment is beautiful and worth protecting. Anne Kubitsky SFS Mexico ’04 has written and illustrated a book, Graycie’s Catch, based on the true events of a whale rescue off the coast of California. The first draft of the book is being sold as a coloring book, inviting readers to interact and become artists themselves. Through collaboration with scientist and ocean activist, Wallace J. Nichols, Anne hopes to connect the book to the Live Blue Initiative to connect young readers to the idea of ocean conservation. Sadie Runge SFS Australia/New Zealand ‘10 of the University of Richmond organized and produced The James River UFO, an Environmental Art Performance Event, which protested pollution in the river. Sadie collected chicken by-products from a local farm and reused them to create a floating raft of feathers, which have been shown to absorb toxic heavy metals from water. The project aims to create awareness for contamination in the river and prompt community dialogue and action. Matt Richter SFS Bhutan ’10 pursued photojournalism and environmental studies as an undergraduate at Boston University, participated in SFS’s first summer program in Bhutan, and returned to Bhutan as an intern. Matt uses his camera to explore both his cultural and natural surroundings, and his photographs provide an intimate view into daily life in remote villages and communities in the Himalayas.